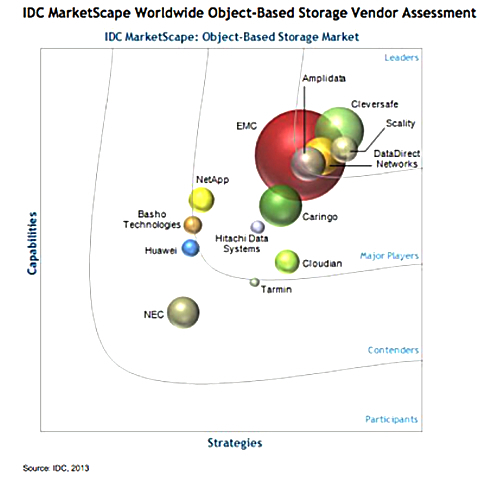 IDC’s latest object-storage "marketscape" shows 18 active players and significant changes in EMC’s and HDS’ status. The chart, IDC’s sort-of answer to Gartner’s Magic Quadrant, positions rivals in a 2-dimensional box, using capabilities and strategies as axes. There are four bands inside the square, one for the "participants", one for the "contenders", one for the "major players", and one for the "leaders". Be successful, and IDC will position you high up the square and over on the right, towards the leaders. The size of a supplier’s dot in the 'scape indicates its relative market share. IDC thinks the object storage market will increase by 27 per cent (CAGR) over the next four years. 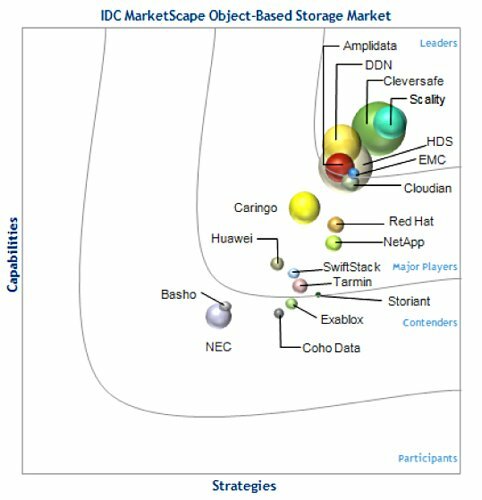 Cleversafe says it is “the industry-leading object-based storage provider [and] was named a leader in the IDC MarketScape: Worldwide Object-Based Storage 2014 Vendor Assessment (December 2014. )” Note the use of “a leader," and not "the leader." HDS' bump up the rankings contrasts starkly with the fading presence of EMC, where ViPR and Isilon object storage has not, apparently, built on the surge established by Atmos. EMC is quite near the point where it would fall out of the leader area and become a major player, along with the likes of Caringo, Red Hat, NetASpp and others.